Situated to the east of Lazio and above Puglia in central Italy, the Abruzzo is one of Italy’s greenest and most mountainous regions. Dramatic peaks and rolling hills dotted with castles and medieval towns are bordered by the long sandy Adriatic coast, ensuring spectacular landscapes and plenty to do for active holidaymakers. With around a third of the region lying in a protected area, the Abruzzo’s timeless landscape remains largely undiscovered by tourists outside of Italy while those in the know return year after year to hike on its forested slopes and enjoy views of powdery peaks and glassy mountain lakes. The region’s location at the far north of the south of Italy has had a significant impact on its history and its unique atmosphere, making it a fascinating destination for anyone looking for an authentic stay in Italy. With three national parks to its name (the National Park of the Abruzzo, the Gran Sasso and the Majella), and more than 30 nature reserves, the region’s principal attraction is its natural beauty. Alongside the challenging mountain peaks, there are rolling hills with fields of wild poppies and plateaux with grazing cattle and sheep. For animal lovers and bird watchers, there are over 100 indigenous species, including wolves, bears, golden eagles and wildcats. While the region does not have Tuscany’s big show-stopping cities, there are several stunning medieval towns that are generally crowd-free. Amongst the most charming are Sulmona, with its cobblestone streets and historic churches, and hilltop Chieti, with its 11th century cathedral. Castles and fortresses dot the landscape. 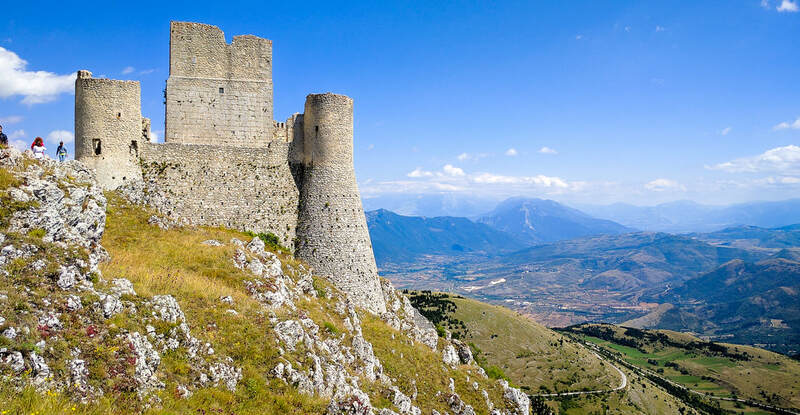 Rocca Calascio is a great crumbling fortress, perched on the mountainside in the province of L’Aquila, while Roccascalegna sits atop limestone formations, surrounded by the Majella mountains. At Pescasseroli, Mancino Castle, which is now largely in ruins, is thought to date back to the ancient Peligni population, which pre-dates Roman civilisation. Amongst the region’s more spectacular lakes are Barrea, Campotosto and Scanno, situated alongside a picture postcard town in the Sangro Valley. In common with every other Italian region, the Abruzzo has its own specialities and culinary traditions. Saffron from the province of L’Aquila is considered one of the best in the world and features in traditional risotto, with lamb and poultry or in cakes. Spaghetti alla chitarra is the region’s trademark pasta, made with a special pasta-cutting tool and often served with ragù, while scrippelle are thin strips of pasta, served in soup, traditionally made in Teramo. Inland, dishes are typically meaty, made with lamb, kid and mutton. Arrosticini, skewers made from lamb and mutton and cooked over an open fire, are very specific to the region. The Abruzzo produces less wine than other regions so the same wines - Montepulciano d’Abruzzo Colline Teramane (DOCG) and 3 DOC wines, Controguerra, Montepulciano d’Abruzzo and Trebbiano d’Abruzzo - will generally pop on most menus. There are four distinct provinces – L’Aquila, Chieti, Teramo, Pescara – although it is probably easier to consider the Abruzzo in terms of the mountains or the coast. In L’Aquila noteworthy sights include the Basilica di San Bernardino, the largest Renaissance church in the Abruzzo, and the Fontana delle 99 Cannelle (Fountain with 99 Spouts), representing the 99 churches that once stood in the city. At hilltop Chieti, highlights include the 11th century Cathedral of San Giustino, the Archbishop’s Tower, a Roman amphitheatre and baths and Roman temples. Sulmona, home to the poet Ovid, is also renowned for its Roman aqueduct and a collection of magnificent churches such as San Filippo Neri, Santa Chiara and Santa Maria della Tomba. The town is also well-known for its sugar almond production – be prepared for confectionery shop windows displaying some fairly extravagant arrangements! In the Sangro Valley, the picturesque town of Scanno is characterised by narrow alleys, Baroque buildings and a glorious lakeside setting. - Dip your toes in the water. Extend your holiday with a few days on the 129km-long coast. Several of the sweeping sandy beaches have Blue Flag status. - Lunch at a working trabocco in the Chieti region is a must. These old fishing constructions sit on wooden stilts that jut out to sea and serve the catch of the day, sprinkled with a squeeze of lemon and dash of extra virgin olive oil. - Join in the party! Abruzzesi festivals include Perdonanza in L’Aquila at the end of August. Elsewhere, there are "sagre" in small towns, and, possibly Italy’s most unusual festival, the procession of snake handlers’ in early May in the small medieval village of Cocullo. 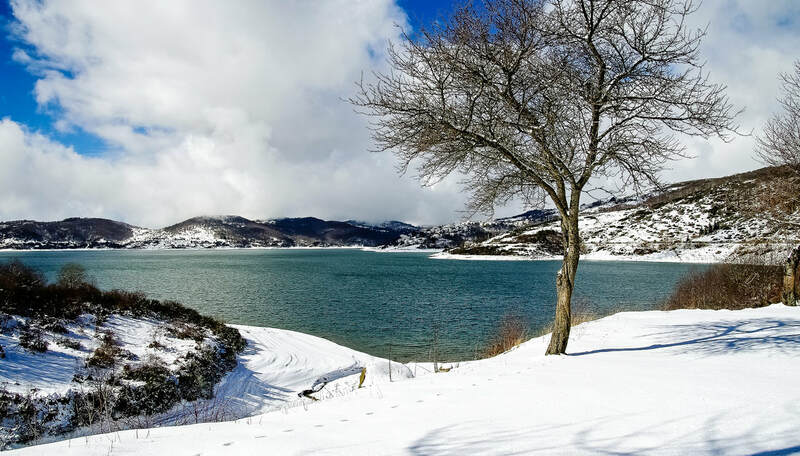 - Pack a picnic of bread and some locally-produced Gran Sasso pecorino cheese and head for the shores of the Lago Campotosto, the Abruzzo’s largest lake. Check the original article on the Hedonistic Hiking website.